every second saturday once a month. Spoken words at its best. Spoken words from the world to the world. One love. One world. One. 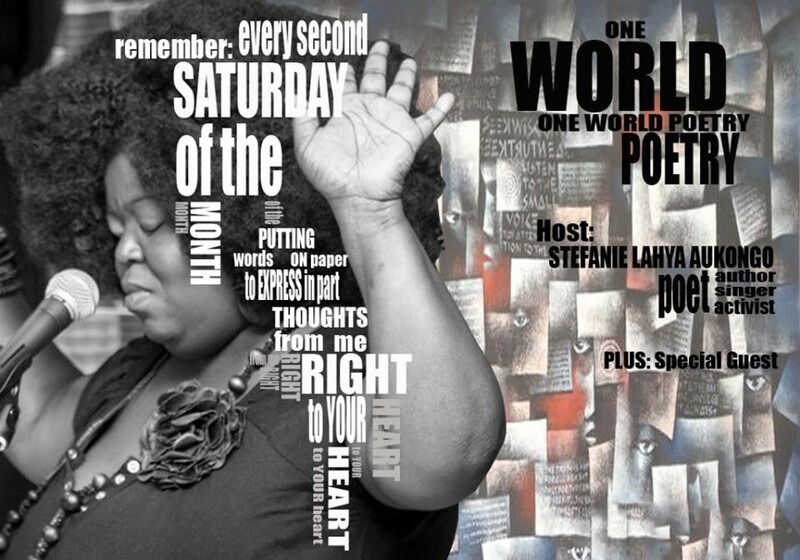 Here you will find all about the one world poetry night. I, the crew introduce you to the current poets, we will upload interesting videos from the one world poetry night-family or write about the spoken words culture, people, Ourstories and impressions worldwide or out of Germany. Oh, just for your information, sometime I’ll host the night and this page in English, sometimes in German and sometimes in both languages. There will be no sorry for that, because the host is panafrican and afropolitan. an jeden ersten Samstag im Monat. Spoken words (gesprochenen Worte) von seiner besten Seite. Spoken words für die Welt, von der Welt. One love. One world. One. Hier wirst du alles finden was mit der one world poetry night zu tun hat. Ich, die crew stellt Dir die aktuellen Poet_innen vor, posten Videos von der one world poetry night-Familie oder gebe Dir hart oder soft facts zur Kultur, Menschen, Geschichte und Eindrücke von Spoken-Word weltweit und aus Deutschland. Oh, und nur zu Deiner Informationen. Ich moderiere die Seite und den Abend auf Englisch oder auf Deutsch und auch mal in beiden Sprachen. Kein Entschuldigung dafür, denn die Veranstalterin in eine Panafrikanistin und Afropolitin. Where: Familiengarten-Stadtteilzentrum des Kotti e.V. Why: Are you kidding me, because it‘s a must! FAQs or Contacts: ask for Lahya (someone somewhere knows her) or check out our page on Facebook one world poetry night on Facebook. Please join us, rummage and recommend us! Kommt gerne vorbei, stöbert und empfiehlt uns! Ist das cool oder waaaaas?? ?